Black urn planters are the trendy new way to add a rustic touch to any area of your home or garden. The ability to add this simple accessory to so many places in your life ensures that this decor will make decorating easier and more fun. Not only are black urns good looking, they are very functional. There are so many ways to use black urns to your advantage. The options for these beautiful pieces are endless and always look great. Finding fun ways to place black planter urns indoors will add a whimsical touch to your interior design that not many other potting options can provide. A small urn as a centerpiece on a table or counter will make an adorable focal point for entertaining. Larger urns can be used through out the home for similar purpose. You can use your black urn planter to fill some space in an awkward corner, or to accent an area that needs a little pop. You can add flowering plants to add some extra color. The black urn is very complimentary to green foliage. It also looks great complimenting colored flowers. It doesn't take an interior design expert to see that black is the perfect accent color. Black urn planters are originally designed for plants, but they have so many other uses. Usually you will find these beautiful pieces in a garden or on a doorstep. The size and material may very depending on the plant inside. A creative and exciting addition to your decor is using a planter urn as a catch-all by the door or in the kitchen. Choose an urn with a shallow bowl and a fancy base. You can also use this same shallow bowled design as a fruit holder. The larger of them can be lined and used as office trash receptacles. Have a little fun and come up with an urn placement that is out of the ordinary. This versatile decor option is perfect for those of us who have an eye for surprising design concepts in the home. If you want the traditional look of the planter, fake flowers and vines also look great in these urns. Outdoors, the natural habitat of the planter urn, also holds excellent decorating opportunities. Let it sit in the flower bed among many other pots and urns to create a cute bohemian look. The classic style of the urn used in this modern way can create quite an atmosphere in a garden. Another way to use the urns outdoors is simply placing one on each side of an entry or walk way. This method is very popular because of it is so functional and looks great. It also adds symmetry which makes for very clean style. What are you waiting for? Make this trendy, beautiful, and functional purchase today. With so many creative and whimsical ways to incorporate these beautiful pieces, you are sure to find a place and style for the black planter urn of your choice. 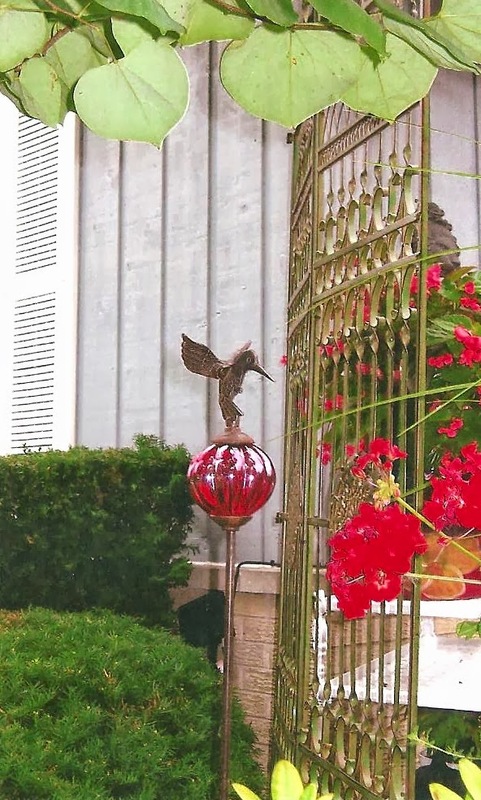 Metal lawn decorations have been used for centuries as a way to express individuality through landscape. A person's style and taste may differ from their neighbor, but one thing that is certain is that the metal lawn decorations will be a sight for everyone to see and enjoy. Time has proven that even drastic weather changes cannot alter the fact that the decoration is still a piece of art, old or new. If one is looking to make his or her yard more rustic, these ornaments can help with that. Rustic decor usually consists of metal decorations that are tarnished, rusty, and even a little bent out or shape or mauled. More times than not, the decorations are more country style than modern, and entail little to no intricate details. Keeping the design simple and sweet is a great way to show the simplistic and natural values in a rustic and modern lifestyle. More modern metal lawn decorations generally consist of moving parts, details, intricate designs, and even bright and vibrant colors. These decorations are almost always appreciated by all who view them, no matter what opinion each individual forms of each piece. These pieces of art can be easily and quickly put together or can take years to perfect. By leaning toward those attributes, one can upscale his or her lawn from ordinary to a sleek and modern extraordinary. There are many living creature styles of decorations that can be found, ranging from roosters to insects to elephants. This variation helps to ensure that there is a decoration out there for everyone to enjoy. Animal decor can come in rustic, modern, bold, bland, and any other form that is imaginable. The greatest thing about animals and metal is that they both can exist in any home or lawn, and still look great. The revival of the trellis is at the forefront of every fashionable home and garden because it provides a classic design with modern options. Bringing the elegance of this ornament into your home or garden will add special charm that no other accessory is able to provide. There are so many fun ways to incorporate this artistic decoration any where and it can also be very functional. Creative options are at your disposal when you add this artistic framework. There are also so many options when choosing your trellis that there is sure to be a particular color, design, or material to fit your unique tastes. In a garden, a trellis will look great against a wall or fence, especially with flowers or vines climbing the curved design. This would be considered the most common use of trellises. The very same bends and curves that make a trellis so great for climbing plants are exactly why a trellis doesn't require any. They make great outdoor decorations all by themselves. Great things happen to your garden when you add one. Trellises are also great for indoors- especially small ones. They look particularly creative about the home because of their whimsical placement. In the case of an indoor trellis, there is also no need for a climbing plant. However, it is always an option. Use your very own trellis to buffer out an awkward corner or make it the centerpiece of your entryway. You can even use it as a decorative screen for the fire place. Separate areas of your outdoor living space in a non-intrusive and creative way by adding a small trellis. This method is more temporary than a wall and a lot better looking. With vines growing full on the design, there can be complete segregation of the entertaining area from where you keep the pool supplies. If you choose not to add climbing plants, you can keep another area visible while making sure the flow of your outdoor living area is intact. A small trellis outside with a lush blanket of clinging vines will also hide unsightly and unavoidable things in the yard or garden. For example, the air conditioning unit can be huge eyesore. Place your small trellis decoration in front of it so that the vines will begin to grow. In no time this grey mass of machinery is hidden, yet still accessible. Other things that need hiding can become a part of your garden with the simple purchase of a trellis. Add privacy to a window or circle a few around a tree stump and you get a huge difference in the appearance and feel of your yard with one simple step. As you can tell, the trellis is a trendy, creative, and worthwhile investment that you can customize any way you would like. These ornaments truly do make all the difference when decorating. Explore every option available to you so you can customize your world with this beautiful accessory. Where do you gravitate to relax and recharge your batteries from the stress of daily life? Is it a little garden nook, where a vine-grown trellis creates a quiet bower? Is it your own patio, where you can relax and chat with friends while dinner sizzles on the grill? Or is it out on your front porch, where you watch the world go by and enjoy the pulse of your neighborhood? Whatever your special haven, it should feed the spirit as it helps you relax. It’s not the place for a boring, factory-molded plastic chair or a plain wooden bench. The furniture should be a work of art that expresses your particular tastes and style. That’s why a wrought iron patio bench is perfect for furnishing your private refuge. Unlike prefab furniture, wrought iron is lively and expressive. From playful daisies to graceful seashells, from plain, sturdy styling to ornate scrollery, wrought iron furniture is available in a huge variety of designs and fashions. If you think of wrought iron as boring black, think again! Wrought iron furniture is typically finished with rustproof paint or enamel in a huge variety of colors. If you like a piece that is plain black, it’s easily painted with a Rustoleum-style spray coating. Worried about care? Wrought iron can rust if it’s left unfinished or if the rustproof painted covering is chipped or damaged. But it’s easily addressed with a bit of care. First, if you purchase plain wrought iron, give it a coat of protective liquid automotive wax before setting it out in the weather. If you find little rust spots, brush them clean with a very fine steel wool pad, preferably dipped in kerosene (use the proper safety precautions). Touch up the area with matching paint or a coating of wax. Another option is to use naval jelly, which will dissolve the rust. Whatever path you choose, the earlier you tackle rust spots, the easier they will be to remedy. And always follow manufacturer’s directions for use and safety. So when you’re considering furniture for your special refuge, be sure to check out wrought iron. You’ll find something you love that will serve you well for years. 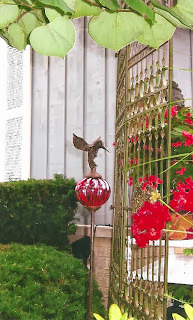 wrought iron patio bench styled with hummingbirds visiting trumpet vines. The bench with ornate grapevines and dangling bunches of grapes would look perfect on the patio where you entertain guests, sipping wine and enjoying the open air. Your front porch will look charming and inviting with a butterfly bench for two, or with funky, painted retro daisies. Do you have a country house? The horse-head bench is the right spot to sit while you take your boots off. So if you think of wrought iron as drab and old fashioned, look around a bit and see how incredible the latest designs are. Your home is your sacred shelter. Therefore you want a home to have the highest degree of loving, positive and serene energy. When your home is filled with devotion, it brims light and goodness and everyone feels at peace and safe. If you ever feel uneasy in a house or if you feel a substantial weight in the air there could be negativity inside of it. When this is experienced, you should consider placing an angel figurine in a prominent place around your house. You can say any type of prayer which comforts you and ask the angels to rid the negative energies inside the home so that the good feelings return. 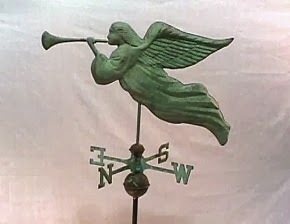 An angel weathervane is a wonderful idea as it will protect the home, bring those inside a feeling of well-being and help to keep all inside safe. Weather vanes are fascinating and their history goes back centuries. One of the earliest weathervanes was of a sea god which resembled a man who had a fish’s tail called Triton (a Greek god). This ornament was constructed in 48 B.C. by Andronicus who was an astronomer. These individuals believed that the wind possessed sacred powers. In 1742 Deacon Shem Drowne constructed America’s first weather vane (a grasshopper) which sits atop Faneuil Hall in Boston. Drowne is also responsible for the rooster sitting on top of the First Church in Cambridge. Americans seemed to enjoy weathervanes which resembled patriotic forms such as the Eagle and the Goddess of Liberty. Victorian buildings during the last part of the 19th century often displayed elegant weathervanes and enlarged metalwork decorated almost every available space of a roof. More simple ornaments became popular after 1900, when a particular sports scene or a humorous weathervane became fashionable. Today a multitude of weathervanes are available from hogs to horses and are easily installed. In order to allow your angel weathervane to float over your home, it will need to be installed so its’ free-moving parts will move on your roof. This piece has adaptable feet and two brackets so it will properly fit on your roof. Even though your angel will watch over you, you want to take precautions while installing it. If you do not feel comfortable doing this task, contact a professional roofer to do it! If you are confident enough to install the weathervane, be sure you use a sturdy ladder that also supports the tools and weathervane (use weather-resistant bolts to avoid corrosion). Be sure you have all you need to accomplish the job when you are up on the ladder to avoid making several trips. When on the roof, secure the vane and be sure that the parts move without effort and that it can be seen. To avoid any roof damage, be sure to place the piece through a rod which goes through the beam along the ridge of the roof (the ridgepole). After the installation is done, there is little maintenance needed for your angel weathervane so she is now free to fly and guard! A Rustic Garden shipped a very large driveway gate today so it is on the way to it's new home several states away. 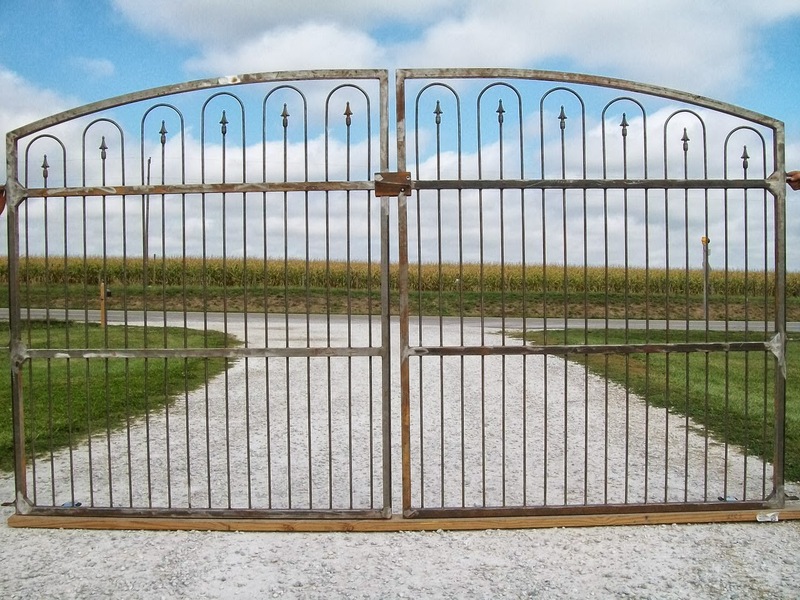 Each entry gate that we make is made by hand to fit the customers driveway. 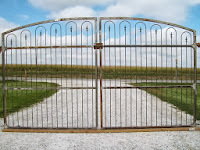 It is quite time consuming but the end result is a gate that fits the space not adjusting the space to fit the gate. This large gate measures over 6' tall and will have an automatic slide opener attached when it is installed. The hoop and spear design has a historical flare while keeping the style simple to coordinate with most any fencing pattern.